How to build my own internal cloud storage? Are there any easy and reliable solutions to set up inhouse private cloud backup for my company and home network? Yes! Backup Cow can be your best private cloud file sync software, which can build internal private cloud storage in your office LAN , home network or even corporate intranet to back up and sync your files locally or remotely. How to Build Internal Private Cloud Storage? How do I build an internal personal cloud? You just need to run Backup Cow free backup program on each computer that will be a cloud node or cloud user. 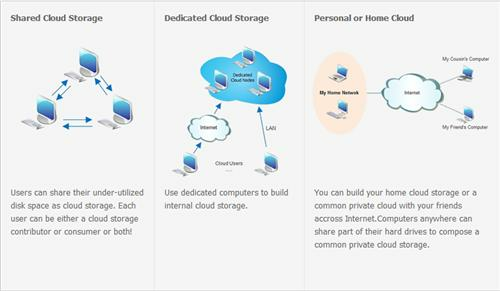 Any users can become a cloud storage contributor or a storage consumer or both. Simply install the Backup Cow software on every computer in your business and it’ll work automatically to backup and sync everything on that computer to the cloud. Nothing to manage, nothing to worry about. Backup Cow's restore process is better than ever. You can easily restore all files and folders on any user's computer, then instantly access your files or download all your files with just one click. Backing up data on CDs or external hard drives can eat up a lot of time. You can only manage to do it every so often. With this fast and effective personal cloud backup software, you will not waste long time to backup your important files. Backup Cow is 100% automatic. You always have the most recent versions of your files in a safe online environment that you can access from anywhere. Backup Cow is the best file synchrozing software and also a private cloud storage builder ! You can make good use of the inhouse computers storage to build internal cloud storage. You can create your own cloud backup.You can back up and sync files inside your private network cloud. This best secure cloud sync software can be your best free backup solution no matter you need make backup tasks in local network or you do need an automatic remote backup software tool.